As autumn settles in and the days grow colder, nature tends to take a back seat to Mother Nature’s frosty chill. Not so in San Diego! Sure it gets colder here, too. But not that cold. Here, flowers continue to thrive pretty much year round, including roses. Which to me is exciting beyond belief because if there’s one thing I love to do is take gads of photos of flowers. Oh my! 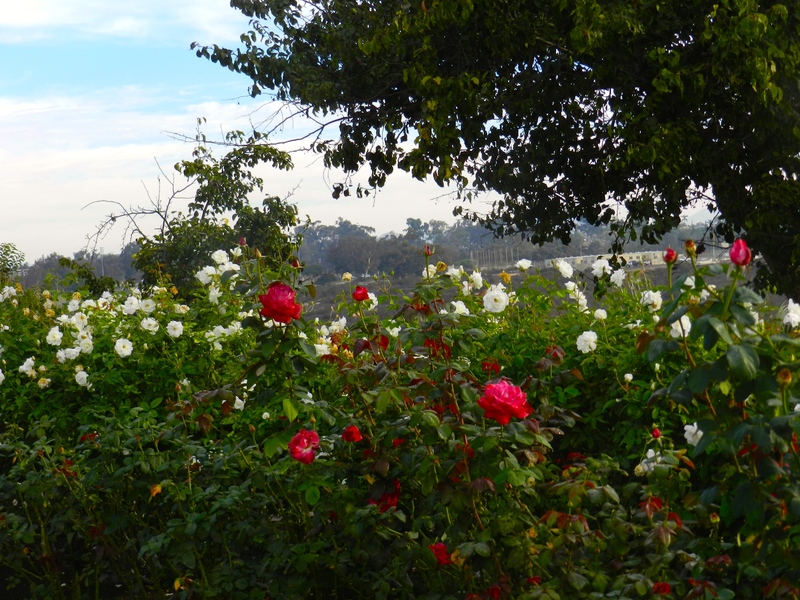 I’m currently writing a story for a local newspaper on San Diego’s largest rose garden, situated in Balboa Park. Some of you may know that Balboa Park, which is celebrating its centennial next year, is a grand, spectacular public open space with a distinctive Spanish influence. With gardens galore, a koi fish pond, fountains and many of San Diego’s best museums, it it a destination for tourists and residents alike. The park was created as the site of the 1915 Panama-California Exposition. It is a majestic work of art in and of itself, but the Inez Grant Parker Memorial Rose Garden is a joy to behold. Can you believe that in the 23-odd years that I’ve lived here in San Diego, I’ve never been to this garden?? With 1,600 roses blooming nearly year round, you’d think I might have caught a glimpse of it at some point. No dice. Well the best way to get to the garden is to cross the pedestrian bridge. You see, the rose garden is not on the main section of the park, but across the street from it. Yet, crossing that bridge is worth it and then some. I must have snapped over 200 photos while there. Roses, roses, roses as far as the eye can see! A rose by any other name would smell as sweet….A rose is a rose is a rose? Hardly. Each one of these flowers is nature’s gift. Proof that there is wonder and love and hope in this world. My photos can hardly do them justice, but go ahead and check them out below. If you don’t live close enough to visit this garden, I hope you’ll find a rose garden near you to delight in. 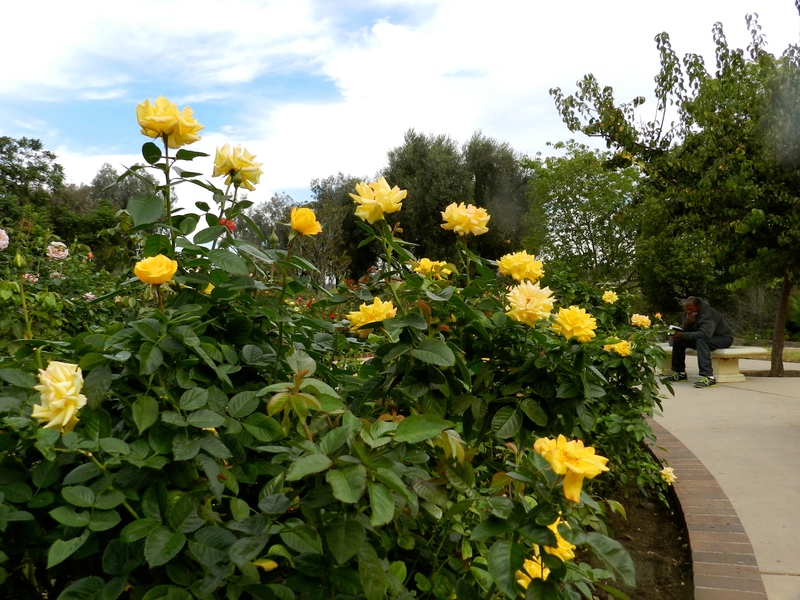 On the other hand, if you do live nearby, know that this rose garden depends on volunteers to come twice a week to prune and care for the roses. So if you’re willing, please contact them to learn more. Being here in the rose garden, where it is calm, quiet and peaceful, is not only good for the spirit, it makes your heart feel like dancing. Indeed, you’d be hard pressed to be sad amidst the enchantment of roses. The yellow rose of Texas? Roses are truly a treasure beyond belief. 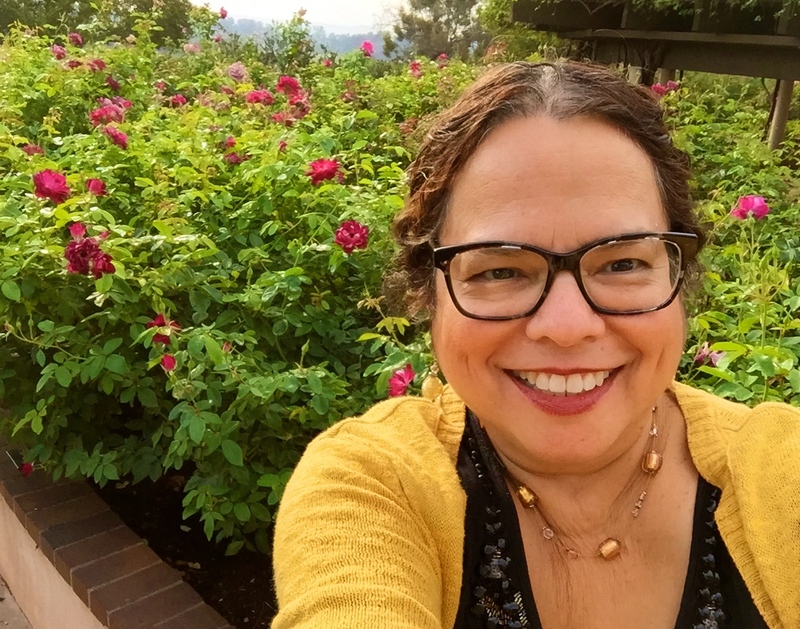 With the abundance of color around me, I couldn’t resist taking a selfie! The most common question these volunteers get? “May I pick a rose?” Answer? A resounding NO! 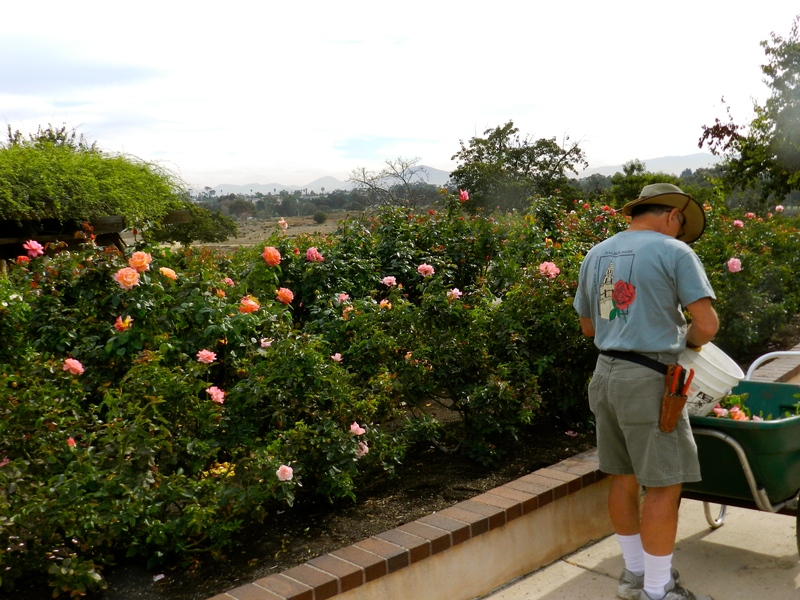 One of about 40 volunteers who comes once a week to maintain the roses. New volunteers are always welcome! Spooky old tree? Sure, this thing may not be a rose, but it’s located by the rose garden. If you ask me, it’s a cactus that looks like a creature from a horror flick. Called “Candelabra,” it is fascinating to gaze upon–much like a car crash that you can’t turn away from. 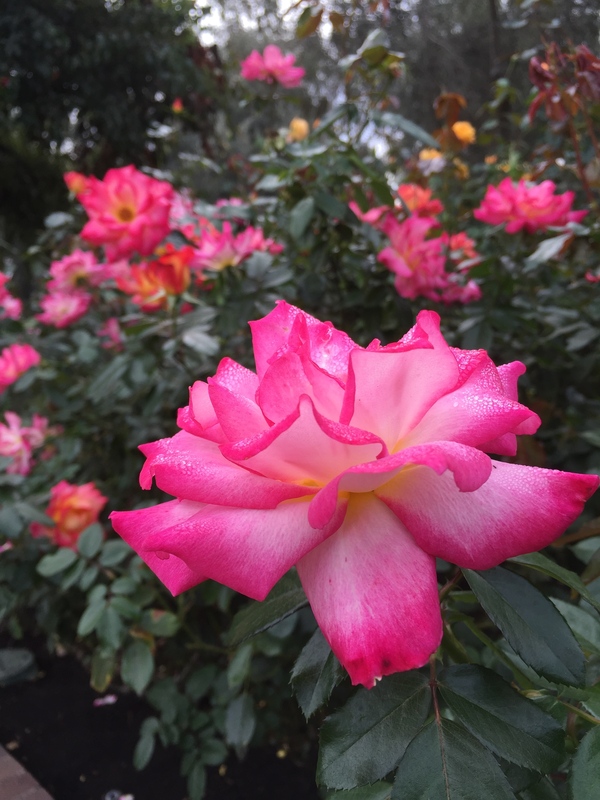 You certainly can’t miss it when visiting the rose garden. As you cross the bridge, it’s on the right. 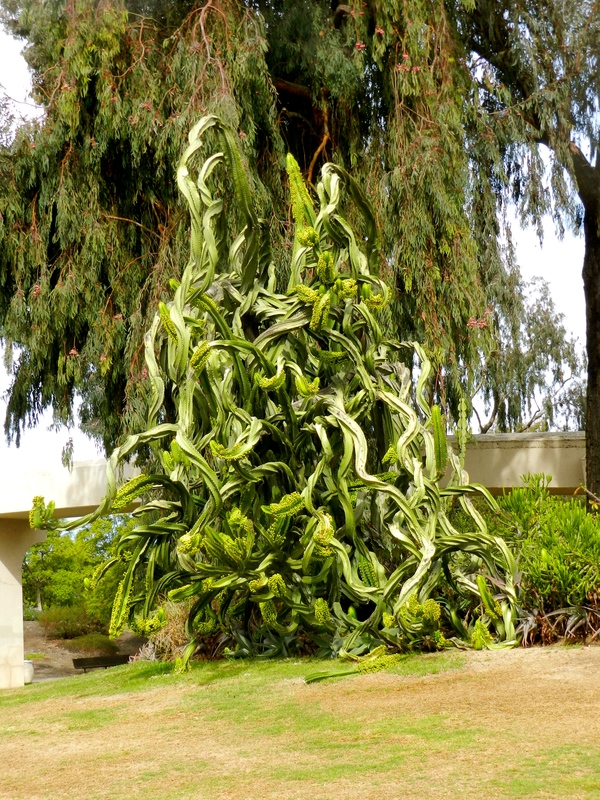 So, if for some crazy reason you don’t like roses, you’ve got to come anyway to check out this strange-looking cactus. Where does it start and where does it end? Only it’s mother knows! This is the closest my camera has ever come to capturing the true beauty of a rose. Takes your breath away. Wouldn’t you agree? 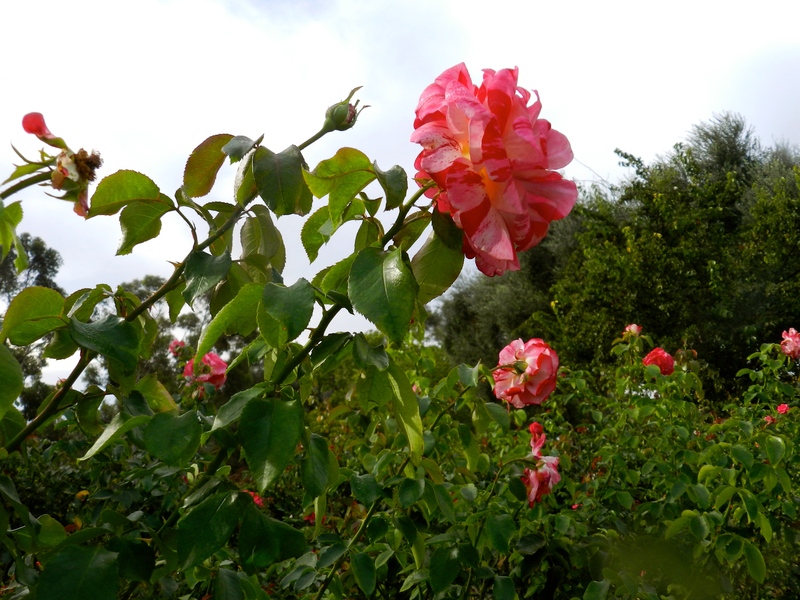 Well, life may not be a bed of roses, but spend a day at the rose garden in Balboa Park and you won’t care! Now, who’s with me? The roses are gorgeous! Good to see you too on the selfie. 🙂 I am not a gardener by any stretch of the imagination, but I tell myself that once my children are grown, I will cultivate my very own gardens with so many varieties of colorful flowers that I can help but be happy! Being in such a setting is serene…makes life feel so much more hopeful, like a “bed of roses” minus the thorns. Oh SommerE! I’m the one who is remiss, in that it took me this long to respond to you. It’s been a crazy month posting every day so please forgive me. Happy Thanksgiving! Totally understood! I’m slowly slaying email. I’ll get to reading all that I’ve missed soon enough – first I have to delete the no-buenos. Monica, I just knew you were a flower person like me. I could get lost among all those roses. 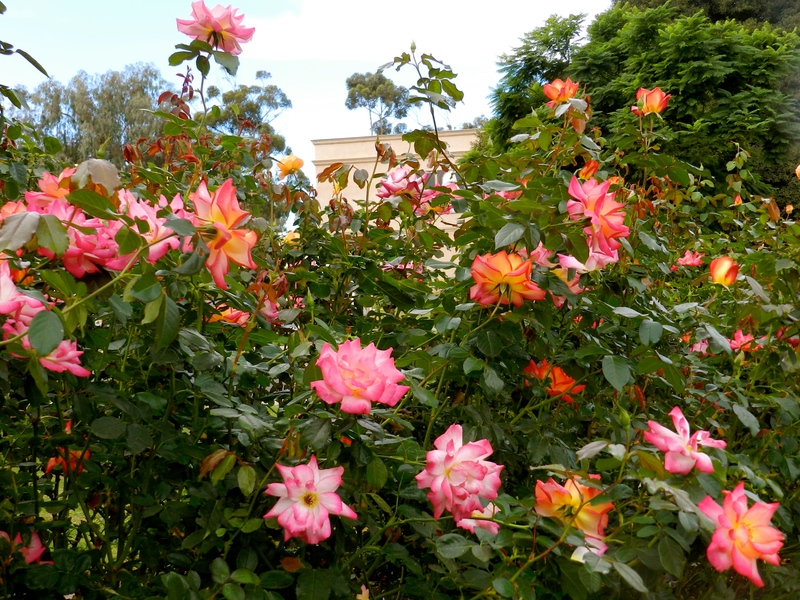 I’ve never been to Balboa Park but I did go to the botanical gardens in Madrid years ago and lost myself in the roses.. I think I stopped and smelled so many of them, I had to be dragged out of there. I wish I had San Diego weather to keep my flowers growing, but here in Northern Cali, we’re a little colder, not so cold that it is miserable, just enough. That spooky tree is something else! Wow! I am all about flowers. In my childhood, I had a very dear, older cousin who lived with us and was responsible for planting miniature pink and white roses across the fence in our front year that separated our property from our neighbors’. It was a spectacular display of roses, brilliant in all their splendor. Do I like flowers? You better believe it. I ADORE them! I love that wild strange cactus !!!!! never seen one like this before ! Seriously, it’s quite unusual and easily draws you in. Kind of reminds me of the banyan trees of Hawaii. Those were mesmerizing, too. Thanks for stopping by and commenting! These are my mother’s favorite flowers. She used to visit cousins in San Diego and visit Balboa Park when she was a girl. One town we lived in while I was growing up was Tyler, TX in deep East TX. It celebrates an annual Rose Festival every October complete with rose covered floats and Queen of the festival. I loved going to the parades back in the day. Thank you for bringing these to us. Well, Georgette, I just want you to know that when I saw the yellow roses I thought of you, which is why I wrote the caption that I wrote. I’m glad your mother got to enjoy Balboa Park, though it must’ve looked a bit different then. Next year the rose garden will be celebrating it’s 40th anniversary, and it only took me 23 of those years to discover it. Sigh. Kim, and so are you, my sweet, thoughtful friend. I think you will be in her presence. What is it they say? Take time to smell the roses. Being there, in the presence of such natural wonder, is a good reminder of what we treasure most, including your memories of your mom. I hope you make it back there soon, Barb. You’re on a roll, Monica — hang in there (and remember, November’s only 30 days, ha!). I love seeing these roses! Central Illinois is deep into Fall right now, with frosty mornings and leaves flying around everywhere one looks, so the sight of colorful, scented roses makes my spirits soar!! How could you have never been here? Beautiful!! Love the tree, that is very cool. I know! I’ve been remiss. I’m just glad I finally discovered it. I’ll never going back soon! I love photographing flowers, the colours and textures of the petals can be very inspirational. I am sure I have sent you some of my rose pictures in the past. Here the leaves are falling from the trees fast and the clocks went back last weekend so it’s getting darker earlier now. Winter is just around the corner. I can believe you not having been to the rose garden in the 23 years you have lived there, often we miss the beauties locally as we search for the same further away. Believe it or not, sometimes I miss winter weather, and wish it would get a little colder here. But I don’t miss it enough to ever want to move away from San Diego. Last year it remained unseasonably warm all winter. We’ll see what happens this year. Gorgeous and in bloom all year round what a gem. Also love your selfie. We have the Boerner Botanical Gardens here in Milwaukee. A visit during their rose bloom helped inspire my interest in rose gardening. I was told the roses are pruned back in January, down to small sticks, and they won’t bloom again until late March. So for three months of the year, no roses. But that leaves nine months of spectacular blooms! There’s a rose garden I love to visit when it’s in full bloom at the NY Botanical Gardens — a place I do try to get to a few times a year. Probably my favorite of their seasonal shows is the Orchid show, and, you would think that, with my love of toy trains I might have gotten to the holiday train show many years before I finally did. Your photos are wonderful — and I’m sure this first visit of yours won’t be your last. The Orchid show sounds lovely. Next year, in honor of Balboa Park’s centennial, they’re having a flower show, including roses and orchids. You can bet I’ll be there! Looks like a lovely way to spend a sunny day. We do have a rose garden, but it’s not nearly as large and all those roses have been buried for the winter. They are something special. It was a glorious way to spend a morning. So fragrant and beautiful. When I was a little girl we had a fence in our front yard covered in a blanket of miniature roses. There is nothing more enchanting than roses. I love the Balboa Park Rose Garden and the cactus garden next to it. Thorns everywhere! But they are both filled with beautiful plants. I make the trip across the footbridge almost every time I visit the park. I’m so glad you found this SD treasure! Shary, it’s absolutely breathtaking and yet also calming. I could go there and zone out for hours. Anyway, I thought of you and had a feeling you’d enjoy it. Now I know you do!